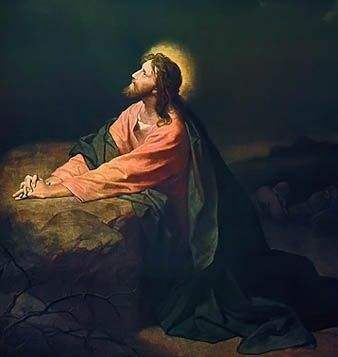 Christ in the Garden of Gethsemane painting by Heinrich Hofmann on Christimages.org. Try to imagine the anguish that Jesus must have experienced when the religious leaders who were responsible for the souls of the people became angry and plotted to kill Jesus for making a disabled man whole. Even though He laid into them and warned them about the consequences of their disbelief, He still loved them and wanted nothing else than for them to place their trust in Him, the Messiah who came to save them. Adoration: praise God for loving us and listening to us and for being powerful enough to act in our lives and in the lives of others. Confession: tell God what you have done wrong and ask Him to forgive you. This is also a great time to forgive those who have hurt you and release any hurt feelings you might have. Thanksgiving: give God gratitude for all His many blessings. Count them out! Supplication: this is one of those “Christianese” terms that means to ask God for what you need and want. This is also a good opportunity to pray for other people, our nation and the world. Just like Jesus, we need to spend lots of quality time with God the Father and trust in the wisdom, provision, strength and peace that only He can give. Lisa Nordell-Detres is a mother of four, grandma to three boys, a pastor’s wife and has worked in the garment and customer service industries in southern California. Besides writing, Lisa enjoys cooking, sewing, organic gardening, hiking, skiing and doing most anything outside. Lisa is a member of the Central Oregon Writers Guild. Lisa was born and raised in Denver, Colorado, studied Christian Apologetics at Simon Greenleaf University, holds a Bachelor’s of Science in Fashion Design from Woodbury University and an MBA from California State University at Northridge. Lisa, her husband and their youngest child now live in central Oregon. When God created the world, He first planted an abundant garden before he ever formed Adam & Eve. Later on, He allowed 17 year old Joseph, the son of Israel, to be sold by his older brothers into slavery in Egypt. Little did any of them realize that many years later, those same brothers would be begging Joseph, now the Pharaoh’s right hand man, for food. Joseph did understand and told his brothers that what they had meant for evil, God meant for good, thus saving the lives of the entire family of Israel. Over 400 years later, the nation of Israel, numbering in the millions, left Egypt and wandered in the desert for 40 years. God again miraculously cared for His people by raining manna (angel food), sending water from unlikely sources and preserving even the clothes and shoes of the people. I’m lucky if my shoes even last a year! There are many more stories throughout the Bible of God’s supernatural provision for His people and Jesus also pointed out that if God takes such good care of the birds of the air and the flowers of the field, He will take care of His people so much more (Matthew 6:26). Even the Lord’s Prayer includes, “Give us this day our daily bread.”(Matthew 6:11) We can count on God to supply our needs each and every day. He wants us to keep asking for His daily care; not as a reminder to Him, but to continually remind us that He is the source of life and all good things. Lisa Nordell-Detres is a mother of four, grandma to two boys, a pastor’s wife and has worked in the garment and customer service industries in southern California. Besides writing, Lisa enjoys cooking, sewing, organic gardening, hiking, skiing and doing most anything outside. Lisa was born and raised in Denver, Colorado, holds a Bachelor’s of Science in Fashion Design from Woodbury University and an MBA from California State University at Northridge. Lisa, her husband and their youngest child now live in central Oregon. Have you ever noticed that when good things happen to good people, we tend to say with confidence that “It was a God thing?” But when bad things happen to good people or when tragedies strike, we are at a loss for words? How can God let this happen? Words cannot express the loss that we feel at the death of a loved one or a major setback in life. It is often during those times of disaster that we can grow the most as individuals. The most powerful comfort often comes from those who have experienced similar losses in their lives. When we hear of people who have experienced substantial loss, they often express one of two perspectives. Either they mourn that “all is lost; life is over” or that “it was all just stuff and we are thankful to be alive.” Trusting in God’s daily provision can give us peace and a higher perspective in any of life’s circumstances. Lisa Nordell-Detres is a mother or four, pastor’s wife and has worked in the garment and customer service industries in southern California. Besides writing, Lisa enjoys cooking, sewing, organic gardening, hiking, skiing and doing most anything outside. In A Relationship is Moving!